Sometimes what you need – particularly at this time of the year when the weather’s dire, Christmas jollifications are over and the bills are rolling in – is a rollicking good read. 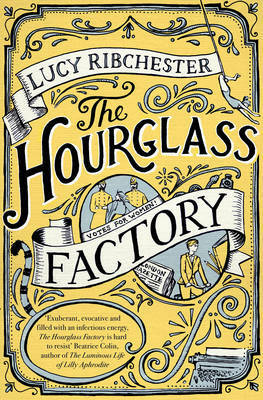 Nothing fancy in the writing department, no phrases to savour and linger over – just a good old-fashioned piece of storytelling with a bit of suspense and some nifty plotting which is what Lucy Ribchester’s The Hourglass Factory delivers with the added interest of a suffragette trapeze artist. It opens with a moment of high drama as Ebony Diamond launches herself into the Albert Hall just as Prime Minster Asquith begins his speech, unfurling the distinctive women’s suffrage banner behind her. Surely worthy of grabbing every headline worldwide given the new Reuters machines spewing out stories as soon as their reporters can type them but she’s pipped to the post by an even more dramatic event. The story’s picked up six months later in November 1912 when Frankie – trouser-clad, cigarette-smoking girl reporter – is sent off to take a portrait of Ebony for the London Evening Gazette, tracking her down to Olivier Smythe’s, a Mayfair corsetier, where she finds her quarry in no mood to have her picture taken. When a woman is found murdered later that day wearing a tightly-laced corset, it seems that Ebony’s efforts for women’s suffrage have been brought to an abrupt end. Then another body is discovered, also corset-laced. Soon Frankie’s caught up in mystery which seems to uncover more questions than answers – as all the best mysteries do – aided and abetted by young Liam and Milly, a snake-charming dancer with a noble pedigree. The Hourglass Factory romps along, picking up corset fetishists, an ex-courtesan, men in tiger suits, mad aristos and a policeman with a heart of gold along the way. Clues are spilled – there’s an ingenious bit of plotting with playing cards and gunpowder – and the plot thickens nicely, all coming together in a suitably frenetic, white-knuckle finale. It’s all a great deal of fun but there’s much to enlighten if you’re interested in the women’s suffrage movement, all neatly stitched into the story with an historical note at the end. Altogether, a very enjoyable piece of escapism and cheers to Simon & Schuster for publishing it in paperback original format, nicely affordable despite the Christmas hole in readers’ pockets. It always comes as a shock to me whenever I read anything about women’s suffrage to remember that universal suffrage was not enacted until 1928 – only women over thirty who fulfilled a property requirement were granted the vote in 1918 which narrowed the field down considerably. My mother made sure I knew that votes for women were hard-won and that I should always use mine, and I do even if it’s to spoil it which I’ve only resorted to once. The thing is, if you don’t vote you can’t really complain about the things our politicians get up to. This entry was posted in Reviews and tagged Lucy Ribchester, Simon & Schuster, The Hourglass Factory, women's suffrage on 23 January 2015 by Susan Osborne.